Slowly the world settles back into clear view and my imitation of a drunken sailor fades back into sobriety. My balance has been restored. I walked 7 km yesterday and enjoyed it. A slow, almost funereal wander. People pause and wonder what I am peering at, fiddling with camera settings. Then, the inevitable “how on earth did you see that?” The answer, my friend is not blowing in the wind, it is simply looking. Familiarity does not breed contempt. It heightens my awareness of what looks different, out of place and therefore is to be explored. 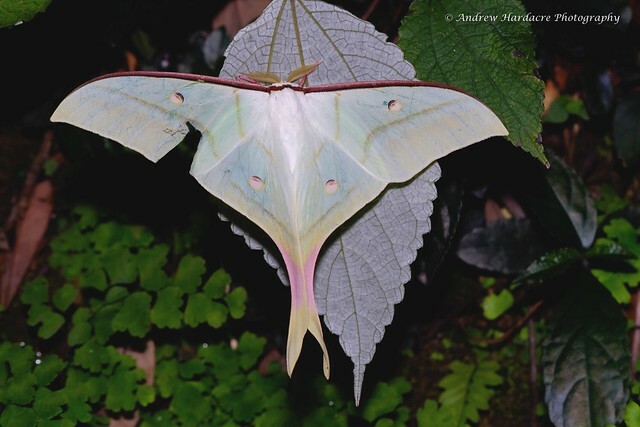 That is how I found the moon moth, Actias ningpoana a few days back. It is a large and quite beautiful moth. It draws ooohs and aaahs from all that see it. This one was sitting right next to a busy path. It was resting on the underside of a hanging leaf so perhaps it is excusable that people just walked past. But each side of the leaf were two paler patches sticking out and to my eye they said two things: that was not how a leaf should look and the shape, colour and size meant it had to be a moon moth. So I gently turned the leaf around and revealed the glamorous creature, a little blusher and some very fine eyebrows. A cross between Julia Roberts and Mariel Hemingway. It also has some slight wing damage. A bird has probably seen the eye spots and attacked them, saving the moth to fly another day. For 15-20 minutes I stood, took a few photos and shared the star with the passers-by. Each and everyone took their own phone pictures to show their friends, children, students……. And maybe one or two will catch the nature bug. This segues neatly into a few words on the iNaturalist City Challenge. Between April 27-30th people in 64 project areas around the world went out to record what they could find in their area. They logged observations, identified species and the number of participants was logged. Hong Kong took part and as it stands this is where we stand. This merits a moment to pause and reflect. Hong Kong is perceived as a financial centre, a shopping paradise (surely an oxymoron) and an urban jungle. Originally described as a barren rock. It is constantly in need of land for development. Why this should be the case crosses a range of issues that are controversial, emotive and frequently distorted. Currently there are 18 proposals up for consideration as to how the ‘crisis’ should be resolved. The list does not include further restrictions on population growth but does include encroaching on designated Country Parks and building on the Fanling Golf Course. Surely there can be little of ecological value in Hong Kong? Well finding roughly 2,500 species in just 4 days suggests there is a vast amount to protect. And with well nigh 20,000 observations there is still a substantial amount of evidence to be scrutinized and identified. I would be amazed if we did not end up well above 2,500 with a few new species for the SAR in there. My health was not good enough for me to make much of a contribution. I did attend one local moth trapping session and I ventured out on my first longer hike in 7 weeks. I certainly found something that has yet to be identified and has left me smiling for over 24 hours since I took the photo yesterday. I wish I knew what it is. 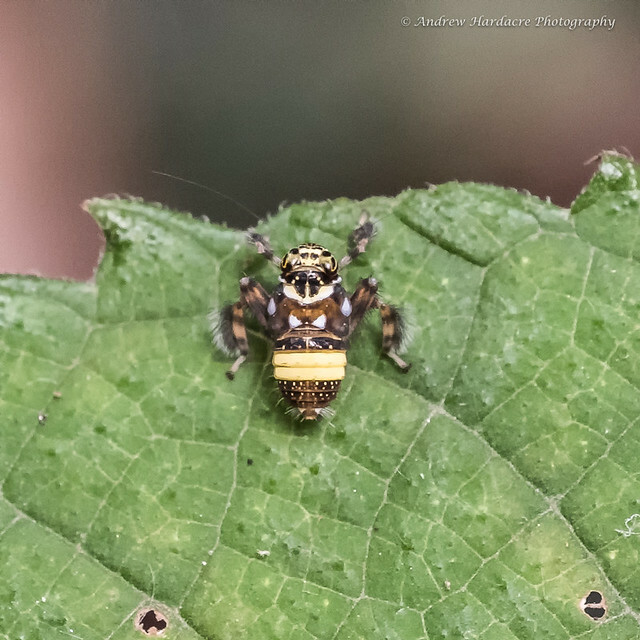 I originally thought it was a jumping spider but someone rather gently pointed out that spiders have 8 legs and my species is deficient to the tune of 2. It has only 6 legs. With even more tact they assured me it is a leafhopper. And there we stop. The decidedly colourful, funky even, leafhopper is the bug with no name. I have posed the question of the organizer: what next? What do we do with the data? How will it be used? Can we monitor trends over time? Data is interesting but arguably useless unless put to work. How do we live in harmony with our fellow Hong Kongers, big and small? How do all these species fit together and which fights, for fights there will be, are worth the effort? I do not have the answers but I hope the barren rock is worth fighting over in ecological as well as political, social and economic terms. ← I’ll know it when I see it. What good news, hearing that you are able to tolerate being vertical again, and following your passion once again. I do like your two offerings, especially the “bug that would be a spider”. Good question re: what will be done with all of that data. Another walk yesterday Yvonne. No more spider bugs but its now getting better for butterflies. Working on the data. Thanks for reading and commenting. Sadly I am not optimistic Rob. Money talks. Andrew, what a find! 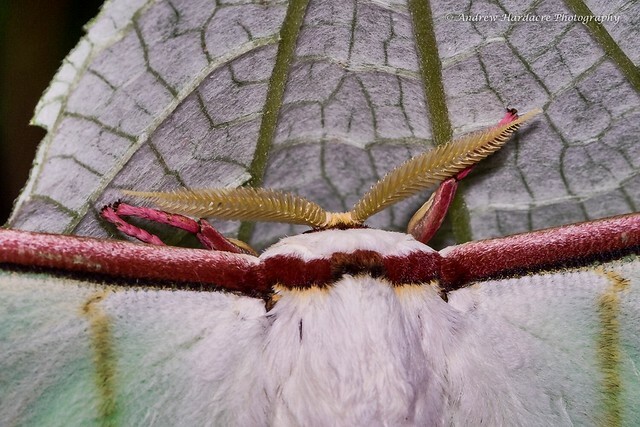 I had no idea that moths were so ‘hairy’. Fascinating to see it so close up and the detail is extraordinary. An absolute beauty. Moon moth could be my new favourite. I hope that the planners and developers do pay heed and work to preserve the rich bio diversity of ‘The Barren Rock’. What a shame if all these species were lost. Your’e doing a grand job documenting it, thank you. Thanks for reading and commenting Yvonne. Moon moths are wonderful but I also like the tiddlers, micros. They are often very colourful and whacky shapes. I must post some. Well the bug is now identified to genus level but not species. Not a spider I’m afraid. Not legless – unlike me for a few weeks but walked again yesterday. Just 8km but an improvement. Thanks for reading and commenting. I would have jumped to the same conclusion in re the leaf hopper. What a marvelous creature you found! I don’t usually take these challenges seriously, but your perspective changed my mind. I do hope the results find their way to the powers that be and good decisions are made there. So good to hear you are back on your feet! I think you would enjoy macro / close ups Bruce. I carry two lenses when I am fully fit. My 100-400 and the macro. I am looking forward to the day our car arrives and I can travel a little further afield for birds as the local patch is a bit restricted. I’m looking forward then too, to the arrival of your automobile. And when my money starts coming in, which it should (I’ve recently shifted house – not country! – and hence am penniless!) I shall get a lens. Little insects – here I come! Glad to hear things are better with you and well-spotted as to the photos. I, too, see things that people wonder about, but as you say, you just have to look. Deciding where to look is a different matter. I’ve found I can look up, out, or down, each of which allows me to see very different things. Going back and forth too much can make me miss things unless I’m taking it slowly, which is also good. Thanks for reading and commenting, Janet. I discovered that looking up reveals another layer of interest. Normally I look downwards to either side but a lot of bugs hide under leaves so looking up can be very productive. Much better thank you Sheldon. Slow progress but in the right direction. The Moon Moth is beautiful and looks like something that might fly over us from The Fairford Air show, only it is not sinister at all. Wonder what it would have been like unpecked. Perhaps you will find a perfect one, but wabi sabi etc! It is beautiful in any case. What a lovely find .. if only we looked closer more often. Imagine what we miss out on. Sad to see the bird peck .. but I would say that moth is lucky to be spared. As for that rather handsome bug .. another great find. We need to preserve our beautiful nature ..